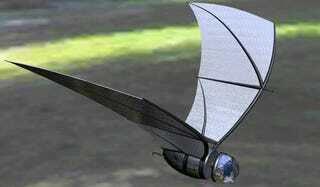 The proposal is for the bat to be just six inches in length, weigh only four ounces and use just one watt of power, backed by a lithium-ion battery, which could be charged by not just solar energy, but wind energy and random vibrations as well. The bat's intended goal would be to run surveillance ops and relay data in realtime, including sights and sounds from minicams and mini-microphones, but also radiation and poison gas readings. The UMich grant consists of $10 million over five years, creating the U-M Center for Objective Microelectronics and Biomimetic Advanced Technology (dubbed "COM-BAT"—pun intended). The focus is to shrink down many electronics that while currently available would only be good if the US Army wanted, say, a 12-foot spy-bat. Not too stealthy.